This may not be a surprise to anyone else, but I am amazed at how much adjusting I am having to do to my work schedule. I am lucky that I come home with my boys after picking them up from school. However at that point all I want to do is touch base with my children about their day and then plop down on the couch checking e-mail, food blogs and facebook and this blog. However while I do have time to check in with my children, and even the time to start Sebastian on his homework, (or as is sometimes the case argue with him about it), I need to start dinner almost right away. It feels like our bedtime routine starts when we come home, if I don't start dinner soon enough our routine is off. Mostly I am loving where we are right now as a family. With both boys in school and my new job everyone has something to share at dinner. Somehow it makes it more cohesive, or maybe that is the reduction in the whining recently over the food I'm offering, as the boys are learning to try more. Julian's application of classroom rules and expectations at the dinner table is often hysterical. One night he sat across from me as I told a story with his hand raised for his turn to speak. However he did not sit there silently, "I'm being an active listener by raising my hand and waiting to speak... are you done yet?" Happily I am still loving my job. I am just having a hard time with fitting everything in. It is a good thing I value cooking! With a busy schedule it is even more important to have a game plan in the kitchen, especially when faced with a pile of vegetables to deal with. However that sounds like planning and my cooking is more often based on whim then planning. This is one of the successes I had recently when heading into the kitchen with the inkling of an idea but not much of a plan. 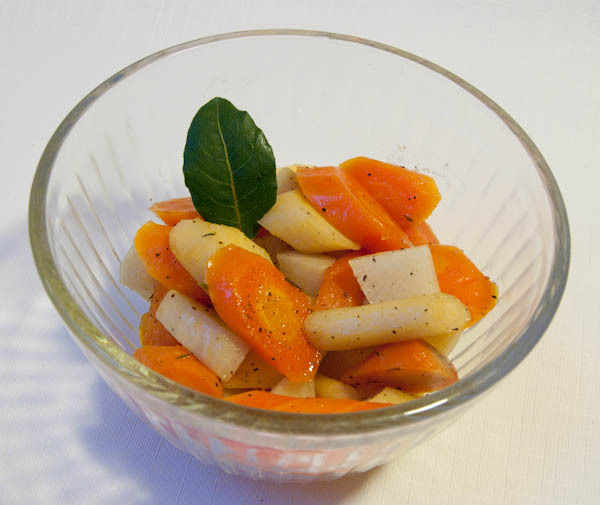 This dish is inspired by the carrots I had last week at an Americorps conference at the Stoweflake resort. The food was surprisingly good, and most of us where getting seconds. However that may also be because an Americorps position is supposed to pay a rate below the poverty level. So folks may have been calorie loading. The local food movement made its way to the labels at the buffet, however the meaning seemed to be a little lost. So for breakfast, in October, in Vermont, the strawberries, cantaloupe, pineapple and watermelon were labeled, "Seasonal Fruit." Sure, somewhere, just not here. However the maple glazed carrots are perfectly seasonal here right now, and will be all winter. 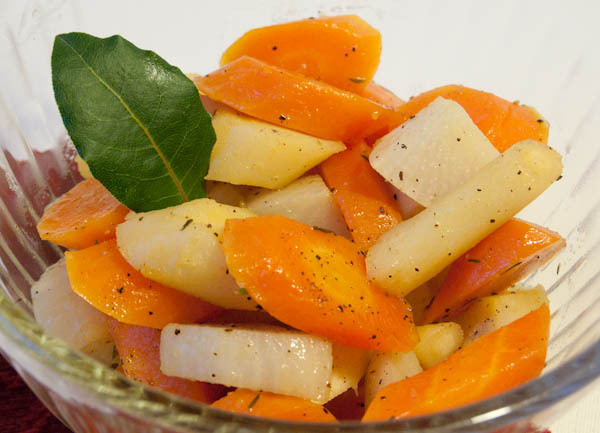 I added parsnips and turnips to mine as I got both this past week at my CSA. I also added a fresh bay laurel leaf and some thyme to help balance the sweetness of the maple syrup and the vegetables. Everyone enjoyed my rendition, although I will admit the boys did not eat the turnips. Melt the butter in a large saute pan over medium heat and add all the other ingredients. Put the lid on and shake the pan to coat all the vegetables in the liquid. Simmer over medium heat for 5 - 7 minutes, until the vegetables are just becoming tender. Take the lid off the pan, increase the heat to high and cook, stirring, often until the vegetables are all coated in a glaze. Taste and adjust the seasoning, remove the thyme stems and serve. Earlier this week I made sour cream cheddar biscuits for dinner from Smitten Kitchen. Sebastian requested biscuits for dinner the night before and I saw it as the perfect opportunity to play with a new recipe. I left out the jalapenos (because leaving them in would have been mean), added 1/2 tsp of baking powder, made them 3/4 inches thick and of course played with the flour. They were tasty and for once there was peace at the table as everyone happily ate. But then, then Sebastian suddenly tasted his biscuit, after eating 2 1/2 of them and asked the dreaded question. "Is this your usual recipe." I am of the not lying to your children about food, so if asked a direct question I am honest. So I told him they had cheddar in them. He looked disgusted, placed the 1/2 eaten biscuit back on his plate and said. "These are disgusting, I feel a little sick now." ONLY TOOK HIM 2 1/2 BISCUITS TO NOTICE! Any sane mother would learn from this not to add cheddar to her baked goods. Obviously Sebastian may love cheddar on its own, in a grilled cheese sandwich or topping pizza, but baked goods are not the same. 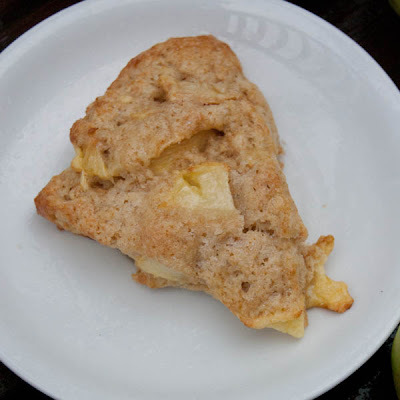 But then I came across a recipe for apple cheddar scones, perfect for the obscene quantity of northern spy apples currently lying around in my kitchen. I helped chaperone a field trip for the preschool at work to a small apple orchard. We were welcome to pick as many as we wanted. Turns out I wanted more then I needed, really a ridiculous quantity of them. A quantity that became even more ridiculous when Sebastian and Julian tried them from the overflowing bags in my car and pronounced them too tart. Northern Spy apples are crisp, tart, bright with a balanced sweetness and when picked fresh from the tree juicy. I love them but not enough to eat my way through my own special brand of lunacy, you would think I was raised during a famine the way I am with free food. So I decided to make a batch of scones, because that will use up a whole 2-3 apples. Yeah, I know, that isn't going to do any good. Lewis asked if Sebastian would like them and I replied, "he can eat toast". Then I quietly planned not to lie to Sebastian, if he asked what exactly was in them I would tell him about the cheddar. 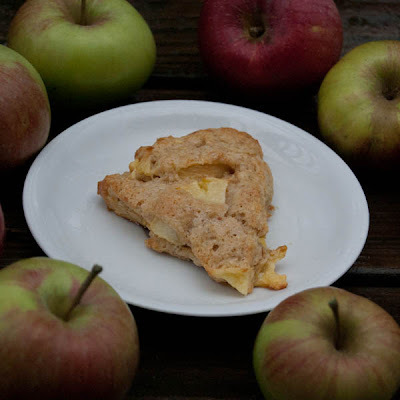 However I would also call them apple scones. They were admittedly a little fussy to make for breakfast as you have to roast the peeled apple slices and allow them to cool before assembling the dough. I woke up early this morning and when I served them at breakfast everyone loved them, for EVERY bite. I loved them enough that I made 2 more batches this evening to go in the freezer. I am sure the scones in the freezer will be delicious, even though just after placing the sheets of unbaked scones in the freezer I stumbled across the grated cheddar in the fridge. I suppose the punishment fits the crime, because after calling them apple scones to my children now I have a batch of exactly those in the freezer. Preheat oven to 325° with convection and 375 °F degrees without with a rack in the center. Line a baking sheet with parchment paper. Peel and core the apples and slice into sixteen slices (I used slices not chunks like Deb as I thought they would get further broken up by the mixer for better apple distribution as well as dry out better in the oven. As the scones were perfect I see no reason to change). Place them on the prepared sheet in a single layer and bake for about 20 minutes, they should be dry to the touch. Let them cool completely (you can do this step the day before and refrigerate them in an airtight container or place the tray in the fridge to cool if you are making the scones right away. Add cooled apple slices, grated cheddar cheese, heavy cream and egg to the butter in the bowl of your stand mixer. Combine flours, 1/4 cup sugar, baking powder and salt in a separate bowl and whisk to combine. Sprinkle over the top of the other ingredients and mix on low speed with the paddle attachment just until it comes together. Be careful not to over mix, so you will have light, tender scones. (If you don't have a stand mixer use a pastry blender to incorporate the butter into the flour mixture until it resembles course corn meal. Beat the egg lightly and mix it with the other ingredients with a silicone spatula or a dough whisk. Be careful not to over mix, so you will have light, tender scones. Generously flour a large cutting board or your counter top and place one half the scone dough on top of it. Sprinkle with flour. Pat the dough into a 1 1/4-inch thick, 3 inch circle. Cut the dough into 6 wedges. Transfer to a parchment lined baking sheet or one that has been greased with butter. Repeat with remaining dough. Leave at least 2 inches between each scone (mine all fit on 1 sheet so I am not sure if I really left 2 inches all the way around, they were fine). If you want larger scones pat all the dough into a 6 inch circle and cut into 6 pieces. Beat remaining egg in a small bowl with 1/8 tsp salt. Brush the scones with egg wash and sprinkle with 1 tablespoon of sugar. Bake until firm and golden, about 20 minutes for 12 small ones and 30 minutes for 6 larger ones. Transfer to a plate and serve. Scones dough can be made ahead of time and frozen on parchment lined sheets before baking. To bake place them on the baking sheets still frozen, brush with egg wash and sprinkle with sugar and bake. They will take a few extra minutes to bake. Deb says the scones were edible the day after baking but after that they were terrible. I have no way of knowing, we ate all of ours. 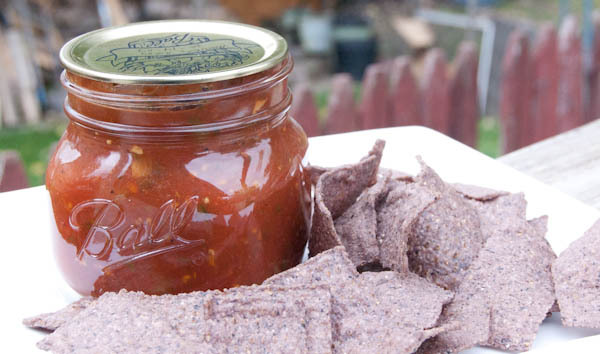 Everyone should have a great salsa canning recipe. A great salsa recipe is the perfect answer to what can I snack on, but even more importantly can be brought to a potluck with a bag of tortilla chips and not be frowned upon, even by the guests who slaved over their stoves before attending the party. I remember one time I brought this salsa, we decided to attend at the last minute as we were getting ready for vacation. In a panic I grabbed a jar of salsa and tortilla chips as we wrangled the boys into the car. My salsa was not the only one in attendance, although it was the only one that was home canned. It sat on the table, mostly forgotten, the other salsa was in front of it on the table. However 4 months later the hostess called, asking if I had any jars of salsa left and if I might sell her one. Apparently a jar of my salsa was the only thing her husband asked for at Christmas time. "My salsa" is really my friend Annie's salsa. She spent years perfecting the recipe, once she could get everyone in her family to agree it was perfect, she somehow managed to get it tested to see if she could safely can it. I know she had a friend who worked for her local extension service, however I suspect she also bribed them with salsa. This salsa is safe to can as written. There are a few things you can change while still maintaining the proper balance of acidity and texture so it is safe to can. It is important not to alter the recipe in a way to lower the acidity or texture. Salsa is consumed straight from the jar without any further cooking which means it has no safety back up. Tomatoes are roughly chopped into about 1/2 inch or larger pieces and the other vegetables should be cut into 1/4 inch pieces. Combine all ingredients, bring to a boil, boil 10 minutes. Pour into hot jars leaving 1/2 inch head space, process pints for 15 minutes in a boiling water bath canner. Tomatoes: Green tomatoes or tomatillos can be substituted for some or all of the red tomatoes, do not reduce total volume. Peppers: The total volume of green peppers and jalapenos is 1 3/4 cups, you may use any combination of spicy and sweet peppers including red peppers to make up the total volume of 1 3/4 cups. I usually use a mix of spicy peppers for a more complex flavor instead of all jalapenos. Do not increase total volume. Tomato paste and sauce may both be reduced slightly, personally I would leave them in. They contribute to the texture of the finished product and I also feel more comfortable knowing something I can and eat without reheating is safe from botulism. "Reduced Slightly" is not clear enough for my comfort. 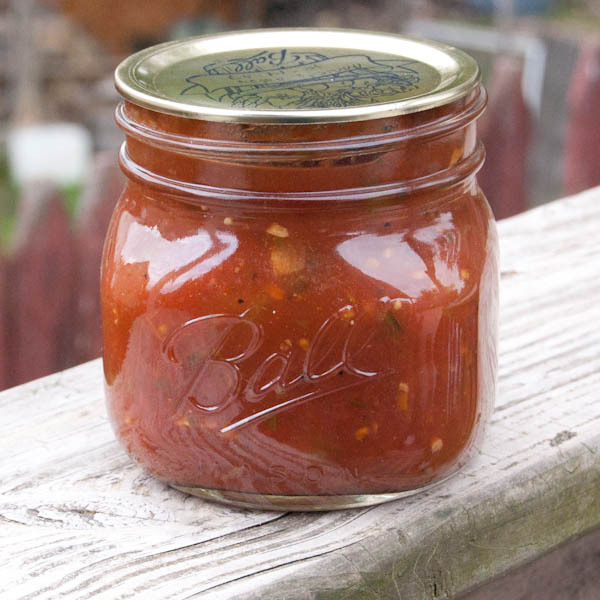 Jar Size: You can process this salsa in smaller jars if you want, it would need the same processing time in the water bath canner. It is not tested and approved for larger jars. 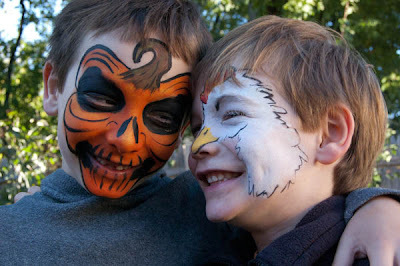 The boys after City Markets Harvest Celebration, they both requested a "Harvest themed face painting." Not that I have them brain washed or anything. I’ve moved! Please sign up for email subscriptions at my new site.